All Dressed Up With A Great Place to Go! It's September... so that can mean only one thing... It's the London Design Festival... Now in its 11th year, the London Design Festival is an annual event held to "celebrate and promote London as the design capital of the world". This is a great event that's always evolving and always brimming with new and exciting ideas. We love being involved in this festival and this year we're delighted to be collaborating with the creative textile duo Wallace Sewell who will be displaying their wares at Designjunction. Known for their colourful woven scarves and their imaginitive upholstery designs for Transport for London, Wallace Sewell have recently produced a range of upholstery fabric for US manufacturers Designtex. 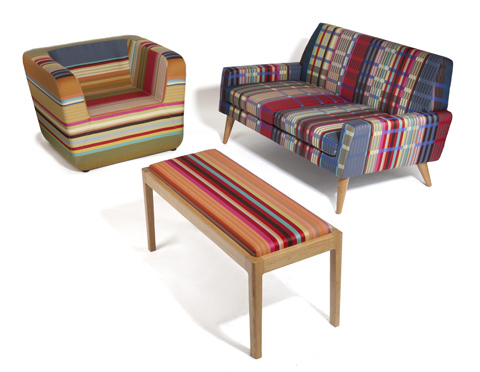 These are bold and beautiful fabrics and we're thrilled to have been able to use them to upholster three of our furniture pieces: our Hatton Chair, our Finsbury Sofa and our Barnsbury Bench. We hope you'll agree that they look pretty smart! We'd love you to come and see for yourself, so please do pop along to the Old Sorting Office on New Oxford Street 18th - 21st Sept, where these eye catching items can be seen on the Wallace Sewell Stand (S4) on the second floor.